The Papers: A cross-party alliance to ‘dump May’? Home 2018 December 7 The Papers: A cross-party alliance to ‘dump May’? Image caption MPs from Labour, the DUP and the Conservatives are “lining up to sack Theresa May” if her Brexit deal does not pass Tuesday’s Commons vote, according to the Times. The newspaper says that, should the PM be ousted, those expected to compete to succeed her include Boris Johnson, Dominic Raab, Amber Rudd, Liz Truss, Sajid Javid, Jeremy Hunt and Michael Gove. Image caption The Daily Telegraph also leads on the prime minister’s future. The paper reports that ministers believe the chances of Mrs May’s deal passing Tuesday’s vote are “zero”, and that she will “told to quit” if she loses the vote. To add to the PM’s woes, the Telegraph suggests three “middle-ranking Eurosceptic ministers” are considering resigning because they “cannot back the prime minister’s Brexit deal”. Image caption The Guardian’s front page also features trouble for Mrs May, who is reportedly trying to “forestall a rash of resignations” ahead of Tuesday’s vote. The paper’s lead story, however, is about activist Tommy Robinson. According to the report, Mr Robinson, whose real name is Stephen Yaxley-Lennon, is receiving “financial, political and moral support from an array of non-British groups”. The Guardian says that Mr Robinson did not respond when asked to comment on the story. 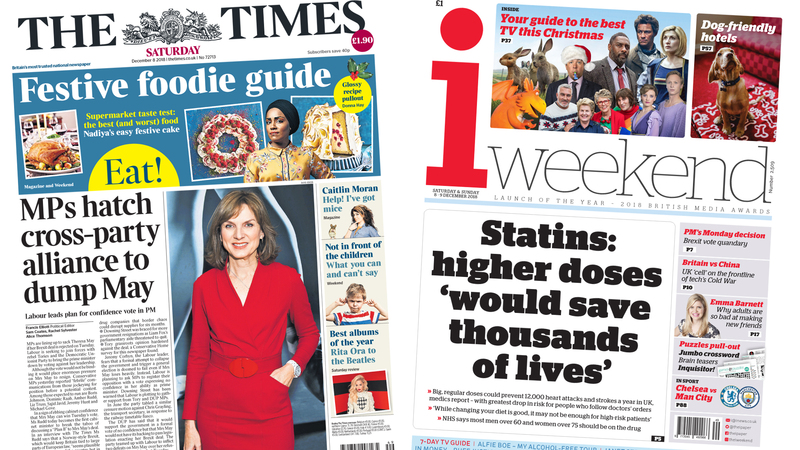 Image caption Statins – the cholesterol-reducing drug – “would save thousands of lives” in the UK if administered in “big, regular doses”, reports the i weekend. The paper, quoting a report by researchers at Imperial College London and the University of Leicester, says the treatment could prevent 12,000 heart attacks and strokes each year. Image caption The Daily Express also leads on the statins story, reporting that some people in the trial saw a 40% reduction “in their risk of suffering a cardiovascular event”. Image caption “You little miracle!” reads the front page of the Daily Mail, which splashes on an interview with the first woman to give birth using a womb transplanted from a dead person. Fabiana Santos was born in Brazil without a womb but, after a successful transplant in 2016, gave birth to her daughter, Luisa. Image caption After a nine-year association with the brand, singer Cheryl has been dropped by cosmetics company L’Oreal, according to the Sun. The paper claims her contract, which saw her appear in shampoo adverts, was worth £4m. Image caption The Mirror says that BBC licence-fee payers might “feel short-changed” this Christmas due to the number of re-runs set to be broadcast over the festive period. The paper says the number of repeats is set to rise 50% in comparison to last year. The story carries quotes from Kate Phillips, BBC controller of entertainment commissioning, arguing some viewers “love” repeats. Image caption The news that Germany’s ruling Christian Democrat Union has chosen Annegret Kramp-Karrenbauer as its new party leader – ending Angela Merkel’s 18-year reign – makes the front page of the FT Weekend. The CDU general secretary narrowly beat Friedrich Merz, a millionaire lawyer, in a run-off vote in Hamburg. Mrs Merkel remains as German chancellor. Image caption The Daily Star’s front page features a story about ambulance crews being made to “hand over” gifts given to them by grateful members of the public.